Kait Kerrigan and Brian Lowdermilk are the Rihanna of musical theater. Just as the Barbadian pop goddess releases hit song after hit song while selling relatively few albums, Kerrigan and Lowdermilk are less known for their plays than for their individual tunes, which have gained them a rabid online following. Their contemporaries Benj Pasek and Justin Paul (Dear Evan Hansen, La La Land) have conquered Broadway and Hollywood, but Kerrigan and Lowdermilk have connected with the millennial fan base like no other musical theater writers; they’re the official composers of the Internet. 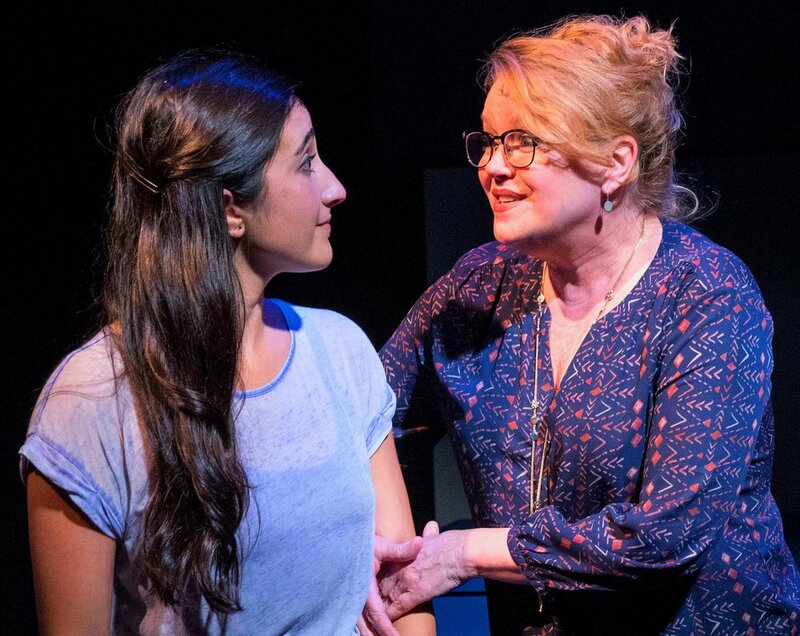 Now, several of their conversationally catchy pop songs have found their way into the long-gestating original musical The Mad Ones, playing at 59E59 Theaters. Krystina Alabado as Sam and Leah Hocking share a rare pleasant mother-daughter moment in The Mad Ones. Top: Alabado with Jay Armstrong Johnson as Adam. 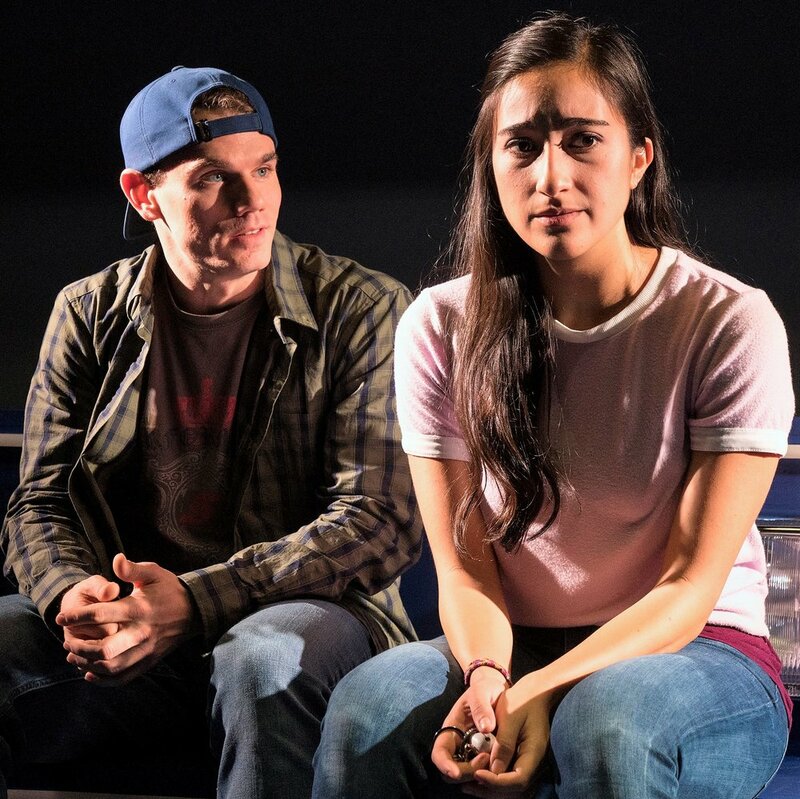 The show opens with recent high school graduate and class valedictorian Sam (Krystina Alabado) sitting in a car, deciding whether to go to Columbia University as planned or hit the highway without a destination, like Dean Moriarty in On the Road. She has recently weathered a senior year that included the death of her carefree yet self-consciously ironic best friend, Kelly (Emma Hunton), a rocky split with her dumb but dependable boyfriend Adam (Jay Armstrong Johnson, covering for Ben Fankhauser through December 3), a tenuous détente with her overbearing Ph.D. mother, Beverly (Leah Hocking), and the repeated failure of her driver’s test. The story, until recently known as The Unauthorized Autobiography of Samantha Brown, is a memory piece looking back on senior year. Beyond coping with the death of her friend, Sam faces the classic dilemma in a high school story: follow her mother’s path or make her own way in the world? Kelly was always the “mad one,” telling Sam that “maps are for brain-deads” and life is more interesting when unplanned, but now she’s gone. You can recognize a Kerrigan/Lowdermilk song by its refusal to settle for one note per syllable; the pair never met a melisma they didn’t like. This can pay great dividends, as in the climax of “Freedom,” when Alabado and Hunton harmonize in fortissimo, traveling up and down the scale as though cruising the open road. Both singers are confident, technically virtuosic performers whose ease alternating between belting and mixing vocal styles fits well with Kerrigan and Lowdermilk’s preferred late-’90s pop idioms. (Even the jokes, which target Sting, Céline Dion, and Beavis and Butthead, live in the ’90s.) But a little melisma goes a long way, as does a lot of fortissimo, and the songs, like the story, become repetitive and fatiguing in their sameness. There’s nothing musically to differentiate Sam and Kelly either, despite their characters’ polar personalities, which the show reminds us of constantly. Beverly, in fact, is the only character to get her own musical style, but when she finally has a solo number, the feminist anthem “Miles to Go,” her comical helicopter parenting veers anachronistically, jarringly, into full-on Mama Rose hectoring. Johnson’s performance is the most convincing of the quartet. He inhabits his character’s skin with a nervous naturalness that that seems easy but is as detailed and virtuosic as Alabado and Hunton’s singing. Lunkheaded is a hard register to play without slipping into caricature, but Johnson makes Adam the play’s dopey beating heart, giving him a depth not written into the character. Emma Hunton as Kelly and Alabado. Photos by Richard Termine. Adam Rigg’s set wisely favors abstraction (a piece of a house here, a few sets of headlights there), and sound designer Alex Hawthorn does the best he can to reduce the disconcerting disjunction between the sound produced by the capable four-piece orchestra and that coming out of the on-stage speakers, while lighting designer David Lander unfortunately relies on a superabundance of haze to evoke the ethereality of memory. Kerrigan and Lowdermilk’s stated mission with their work is “to make musical theater relevant and make pop music work on stage,” which begs the question: relevant to whom? Sure, musicals don’t enjoy the cultural capital of their pre-rock ‘n’ roll heyday, but this condescension belies a self-conscious ambivalence that plays out on stage. The Mad Ones works as pop music (inasmuch as you leave humming the tunes), but not as theater. The plot rambles, as befits a memory play, but without any sense of forward motion among the loops and digressions, the story simply spins its wheels. Prospect Theater Company’s The Mad Ones plays through Dec. 17 at 59E59 Theaters (59 E. 59th St., between Madison and Park). Evening performances are at 7 p.m. Tuesday through Thursday, and at 8 p.m. Friday and Saturday. Matinees are at 2 p.m. Saturday and 3 p.m. Sunday. There is an abbreviated schedule Thanksgiving week. For tickets, call (212) 279-4200 or visit 59e59.org.